We’d love your help. 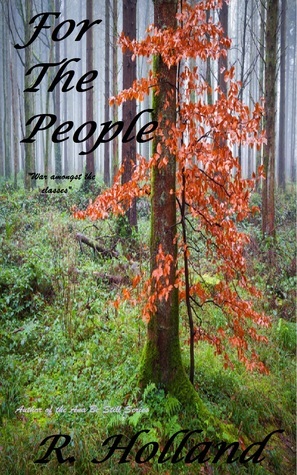 Let us know what’s wrong with this preview of For the People by R. Holland. "There once was a government so divided. It was divided amongst classes, I believe. Because the government was so divided, the people became divided as well. No one agreed on what to do. There was gun-control, health care reform, and something called education reform. Or so I’ve been told." To ask other readers questions about For the People, please sign up. Please where is this book? This is the first installment of 'For the People: Post Secession' saga. A well themed story plot frames a strong undertone for a suspenseful drama. The characters are complex as the 'Post This is the first installment of 'For the People: Post Secession' saga. A well themed story plot frames a strong undertone for a suspenseful drama. The characters are complex as the 'Post Secession' world begins. This book would appeal to many genres with an assorted mixture of romance, adventure, and war. Kiranda was a young girl who loved playing with the neighbor boy, going fishing with her father, and helping her mother do chores. She was a member of the Nadirs living a peaceful farm life where one works hard for everything they have, not many of the fancy new gadgets but a warm comfortable home and the love of family. That is until the day the Zeniths came and attacked their camp. She watched her father be killed eight in front of her face, vowing to kill the man who took his life, and then w Kiranda was a young girl who loved playing with the neighbor boy, going fishing with her father, and helping her mother do chores. She was a member of the Nadirs living a peaceful farm life where one works hard for everything they have, not many of the fancy new gadgets but a warm comfortable home and the love of family. That is until the day the Zeniths came and attacked their camp. She watched her father be killed eight in front of her face, vowing to kill the man who took his life, and then was kidnapped along with her best friend Thatcher. They were taken to a testing facility in Zenith territory along with her mother and Thatcher's father. The facility was set up by a doctor who was trying to give the Zenith's the ultimate in healthcare, being able to heal and never getting sick, but didn't want to try on Zeniths so he used what he saw as low class Nadirs. Thatcher and Kiranda were just 9 and 7 at the time they were taken, young children ripped from the only world they had ever known and forced to undergo a gluttony of tests. Kiranda was able to visit with Thatcher's father regularly even though he himself was not, in fact he didn't know that his father was even still alive. The children were able to play together some days though many Thatcher was to run down from the testing being done on him to even get out of bed. Kiranda was strong even though she was so young, she experienced things that no child ever should and vowed that one day she would make them all pay. At the age of 9 she got her chance to escape waking Thatcher in the middle of the night so they could get out of there. After making it to the fence that separated Zenith from Nadir lands, Kiranda had a hard time making it over so Thatcher fell back to give her time to escape and was taken down in the process. Kiranda ran as fast and hard as she could knowing in her heart that Thatcher and everyone else she loved was dead. Kiranda was rescued and taken in by a loving family, she started going by the name Kira. Kira's new family was very loving and she easily fell back into the flow of Nadir life helping with hunting, fishing, and chores. A few years in the Zenith's struck again and took the lives of Lucille's husband and son. This left Kira and the nine month pregnant Lucille to fend for each other and the new baby who came only a few days after the attack. They stayed strong and made it through though when Kira was old enough she decided it was time for her to head into Zenith land and find a way to kill them. And thus the real journey began. "I have learned to believe what I see and trust no one." "It makes me wonder. Where did they go wrong to mess it all up?" "This is the story of a girl who fights for her peoples’ rights… my people. I fight for what I believe in, knowing vengeance is the only answer. They say vengeance is a dish best served cold. I say it doesn’t matter. As long as vengeance is served to those well deserving to choke and die on its filling, it doesn’t matter. Hot or cold…sometimes… vengeance just needs to be served." "I promise you, I will make them pay. And I will never forget." "As usual, he has a needle in hand if she doesn’t comply. She never did, as no nine year old should ever have to. He pulls the covers back and gently strokes her hair." "If he only knows how badly he’s getting under my skin right now. If there weren’t so many people around, I would probably kill him right now." "Zack, I don’t understand. How do you trade for things with your hand? I thought you used cash or money.”“We used to use cash or money. Now we pay with our imprints on our hand." "If she doesn’t come back in three days, then you can go look for her. But, Cutter, it’s a big place. Their world is so much more different from ours. You’ll never find her." "I look at him and for the first time I instantly think of Thatcher." "I love everything about his lips and the taste of his tongue. He stops only to look me in the eyes and then cups my face again, kissing my lips and neck." "A dying man once held my hand and told me that you’re nothing more than the promises you keep." "I really mean you and your family no harm. It’s just that I lost her once. I can’t lose her again." "He’s like the missing piece to my puzzle. Everything fits with him and seems like we might actually have a chance at normalcy." "I know this is the first of many. That slowly they will all pay. And that this was just the beginning!" "Tomorrow’s not promised to any of us. So you take today and just be happy." "You will marry my son and that’s it!" "Charlie tells us he still believes it was the government that started all of this. That they just covered it up. The government sounds like they may have had some control or power back then, but lost it." "And I will make them pay. I do this for all those I lost and all those I will lose. This is for everyone. This is for my people." Thank you to the author, R. Holland, for gifting me with a free copy of For the People: Post-Secession in exchange for an honest review! One thought pops into my mind when I think about this book: more. That's what would have made this into a 5 star book for me. More on the world, more on the facility, more about Kira and Thatcher as children, etc. I think the biggest thing that would have helped would be to lengthen the introduction sequences. Everything was beautifully done, it just felt like i Thank you to the author, R. Holland, for gifting me with a free copy of For the People: Post-Secession in exchange for an honest review! One thought pops into my mind when I think about this book: more. That's what would have made this into a 5 star book for me. More on the world, more on the facility, more about Kira and Thatcher as children, etc. I think the biggest thing that would have helped would be to lengthen the introduction sequences. Everything was beautifully done, it just felt like it was over with a snap of my fingers. The page count is 173 pages. So. Other than the 'more' part, as I said above it was beautifully done (I'm sorry for my terrible grammar - I just can't type today). The world (from what I got a glimpse of) was amazing. In a way, it's your typical dystopian book... and then you read 5 more pages and it's just like 'whoa'! The way the author added in the two peoples is fantastic. The 'judgement' message is beautiful as well. I also loved Max and Kira's relationship. It did get a bit hairy for a bit but they figured some things out. Charlie really got on my nerves though. I understand why he's obsessed with history (I would be too - the past influences the future after all) but the whole threatening part? He had his reasons I suppose. Overall, a very addicting read. I loved the world, the message, and the characters. I just wish it was a bit longer and expanded on the first two sequences. I was given a copy of the book by the author in exchange for an honest review. For the People: Post-Secession is the story of a young girl turned powerful woman named Kiranda. In Kiranda's world, there are two classes, the lower class and the upper class. The lower's class's territory is in the south. They live very simple, almost primitive lives because the upper class has taken all resources from them. A hobby of the upper class is to frequently invade the lower class's territory, kill as many I was given a copy of the book by the author in exchange for an honest review. For the People: Post-Secession is the story of a young girl turned powerful woman named Kiranda. In Kiranda's world, there are two classes, the lower class and the upper class. The lower's class's territory is in the south. They live very simple, almost primitive lives because the upper class has taken all resources from them. A hobby of the upper class is to frequently invade the lower class's territory, kill as many as they can for sport, and record the killings to watch as entertainment later. As a child, Kira and her friend Thatcher, along with Thatcher's father and Kira's mother are captured by scientists of the upper class. They are experimented on by the scientists to try and find a way to make the upper class invincible. Their parents don't survive the experimentation, but Kira and Thatcher do. The upper class is able to regenerate and now has immunity against all diseases. However, Kira and Thatcher have these powers as well. In a daring escape attempt, Kira narrowly escapes the facility with her life, only surviving due to the healing powers she obtained during her kidnapping. She is found and adopted by a lower class family, and her quest for vengeance begins. 'Post-Secession' is the first book in Holland's 'For the People' series and the story follows teenager Kiranda as she embarks on a mission to exact revenge on those who have wronged her and her people. Firstly, the vast gap between the higher and lower classes is shocking and is likely to make you feel very grateful for the everyday things you take for granted. Holland has used extremes in these differences as well as in the brutality of the hunters and the opinions of the characters, among other 'Post-Secession' is the first book in Holland's 'For the People' series and the story follows teenager Kiranda as she embarks on a mission to exact revenge on those who have wronged her and her people. Firstly, the vast gap between the higher and lower classes is shocking and is likely to make you feel very grateful for the everyday things you take for granted. Holland has used extremes in these differences as well as in the brutality of the hunters and the opinions of the characters, among other things. For me this strikes just the right tone for a story with a burning need for revenge at it's heart. The story is quite fast paced and full of action with splashes of humour and a believable romance intertwined with the main plot. I must warn there is some pretty brutal violence and Kiranda has a harrowing backstory. The extremes can make it seem a little less believable in places but overall they are what make this such a captivating read. This book was very hard to put down once I started reading and I was quickly lost in Kiranda's world as she went off on her journey. All in all this is a captivating novel and a thrilling start to what looks to be an exciting series. Recommended for fans of dark fantasy and dystopian sci-fi. Great book. Think Hunger Games but at the same time nothing like it. The world has been divided.....the ones who 'have' and the ones who 'don't'. And the ones who 'have' are hunting the ones who 'don't'......for the fun of it. The ones who 'don't' want to fight back but they can't as the ones who 'have' don't seem to die. But now they have one of them......well technically 2 of them, except only one has lived amongst them. Now it's time to fight back and take back their world. Definitely an enjoya Great book. Think Hunger Games but at the same time nothing like it. The world has been divided.....the ones who 'have' and the ones who 'don't'. And the ones who 'have' are hunting the ones who 'don't'......for the fun of it. Books ou R. Holland has lived in Texas all her life. She lives with her supportive husband and three wonderful children. She loved to write poetry at a young age and has tried a hand at writing short novels. Along with fishing and being in the outdoors, she enjoys writing horror, paranormal romance, and adult dystopian. Books Coming Soon in 2016!